Last Saturday, a US consulate employee and his pregnant wife were gunned down in their SUV in Ciudad Juarez while their seven month old baby watched from the backseat. Just minutes later, another consulate employee was killed at point-blank range in the northern part of the city. Both shootouts took place in broad daylight and were executed with robotic precision. It was clearly the work of professionals. The only thing that stands out about these incidents, is that two of the victims were American citizens. Otherwise, it’s just “business as usual” in the murder capital of the western hemisphere. Juarez has been rocked by a wave of gangland-style killings for the last two years. The statistics are mind-boggling. 50 people were killed last weekend alone (4 of the victims were beheaded) and there have been more than 500 homicides since the beginning of 2010. All told, more than 19,000 people have been killed since Mexican President Felipe Calderon took office in 2006. Juarez is presently the most dangerous place in the world, worse has Baghdad or Kabul. The violence in Juarez is not accidental. It’s the result of a deeply-flawed US/Mexico policy. The Merida Initiative, which was signed in 2007 by President George W. Bush and Calderon, has led to the militarization of law enforcement which has intensified the battle between the state and the drug cartels. Plan Mexico–as Merida is also called–has increased the incidents of gang-related crime and murder by many orders of magnitude. The military is uniquely unsuited for tasks that should be handled by criminal investigators or the police. That’s why the death toll keeps rising. The bottom line, is that the troubles in Juarez have more to do with Plan Mexico than they do with drug-trafficking. This is “policy-driven” carnage and the United States is largely to blame. Laura Carlsen: The Obama administration has supported Plan Mexico and even requested, and received from Congress, additional funds beyond what the Bush administration requested. In the three years since Calderon launched the war on drugs in Mexico with the support of the US government drug related violence has shot up to over 15,000 executions and formal reports of violations of human rights have increased sixfold…..Washington recognizes serious problems with the drug war model and yet continues to claim, absurdly, that the rise in violence in Mexico is a good sign–it means that the cartels are feeling the heat..
NAFTA transformed Juarez into a manufacturing hub where assembly plants and electronics companies mass-produced all types of goods that were shipped to the United States tariff-free. In the last few years, however, corporations have exited Mexico en masse seeking cheaper labor costs in China. According to the Wall Street Journal: “Since 2005, 10,600 businesses—roughly 40% of Juárez’s businesses—have closed their doors, according to the country’s group representing local chambers of commerce.” Free trade has left Juarez in ruins which has only added to the current troubles. Carlsen confirms that Plan Mexico is not so much about the fictitious war on drugs as it is aboutcreating a business-friendly authoritarian regime that will crush any threat to state/corporate power. By throwing his support behind the current policy, Obama is merely picking up where his predecessor G.W. Bush left off. CHARLES BOWDEN: “This is in a city where people live in cardboard boxes sometimes. Ten thousand businesses have given up and closed in the last year. Thirty to sixty thousand people from Juárez, mainly the rich, have moved across the river to El Paso for safety, including the mayor of Juárez, who likes to bunk in El Paso. And the publisher of the newspaper there lives in El Paso. Somewhere between 100,000 and 400,000 people simply left the city. A lot of the problem is economic, not simply violence. At least 100,000 jobs in the border factories have vanished during this recession because of the competition from Asia. There’s 500 to 900 gangs there, estimates vary. “The outlawing and criminalizing of drugs and consequent surge in prices has produced a bonanza for producers everywhere, from Kabul to Bogota, but, at the Mexican border, where an estimated $39,000m in narcotics enter the rich US market every year, a veritable tsunami of cash has been created. The narcotraficantes, or drug dealers, can buy the murder of many, and the loyalty of nearly everyone. They can acquire whatever weapons they need from the free market in firearms north of the border and bring them into Mexico with appropriate payment to any official who holds his hand out. The real reason US powerbrokers want to militarize Mexico is to counter the leftist social movements which have sprouted up everywhere in Latin America. The administration wants to get a foot in the door so they can roll back the advances that have been made in health care, civil liberties, education, wealth redistribution and land reform. The US wants to quash the burgeoning unions, the indigenous communities, and pro-democracy groups which have taken root and replaced the kleptocratic regimes which were propped up by Washington. The Merida Initiative is an attempt to return to the dark days of oligarchy and torture, of death squads and “dirty wars”. Clearly, Uncle Sam will not be easily deterred; it will take determined resistance from grassroots organizations and engaged citizens. As for the faux “drug war”; no one has written more persuasively on the topic than Counterpunch editor, Alexander Cockburn. Here’s an extended excerpt from an article written by Cockburn back in June, 1998, titled “The Drug War: a War on Poor, Lower Classes”. “United Nations’ special session in New York on drugs. Hundreds of prominent people from around the world signed on to the view that the drug war has been a disaster and the time has come for a truly open and honest dialogue about future global drug control policies. The statements to which the signatories put their names are mostly unimpeachable common sense:Drug war politics impede public health efforts to stem the spread of HIV, hepatitis and other infectious diseases. Human rights are violated, environmental assaults perpetrated and prisons inundated with hundreds of thousands of drug law violators. All true, and every phrase repeated, proved and doubly proved year after year. The answer is plain enough, particularly if one takes a look at the history of drug wars over the past 150 years. 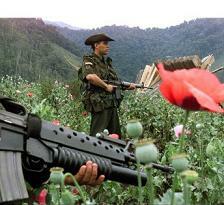 These drug wars are either enterprises that expand the drug trade or pretexts for social and political repression. In either case, the aim of halting the production, shipment and consumption of drugs is not on the agenda. Domestically, the drug war has always been a pretext for social control, going back to the racist application of drug laws against Chinese laborers in the recession of the 1870s when these workers were viewed as competition for the dwindling number of jobs available. …. President Nixon was helpfully explicit in his private remarks. H.R. Haldeman recorded in his diary a briefing by the president in 1969, prior to launching of the war on drugs: Nixon emphasized that you have to face the fact the whole problem is really the blacks. The key is to devise a system that recognizes this while not appearing to. So what was the system duly devised? The 1986 Anti-Drug Abuse Act, with its 29 new minimum mandatory sentences, and the 100-to-1 sentencing ratio between possession of crack and powder cocaine, became a system for locking up a disproportionate number of black people. Obama knows that the war on drugs is a sham, but that won’t stop him from committing billions more to Plan Mexico. In fact, it’s already a done-deal. What the administration wants is a “hemispheric security policy” which creates a hospitable environment for resource extraction and corporate exploitation. And, they don’t care how many people get killed in the process. That’s why the death toll in Juarez will to continue to rise.